Photo courtesy of Barton Soucy. Spotted in Japan jewelry shop. Much better than that Pyrenean lamb ribs on the grill. Careful where you put those fingers. Unfortunately, I don’t speak Braille. No English required, I can understand body language just fine! For ¥3,800 you better do more than just feel. I have a long felt want. Blow you? No, you have to go to the shoe store for that. Now I understand why bling-bling is so popular. Once for no, twice for yes, three times for OH GOD YES!! Let your fingers do the talking. We can feel you will leave this shop with your Europe-America wallet empty!! This must be a psychic store. Can you feel me with your tonsils? No? Wait a second. . . . How’s that? SALE: Buy one, feel FREE to buy two more! Uh, this is not the sexual harassment pub, is it? @mickeygreeneyes: That’s some deep…… conversation. Are you sure this isn’t a Hungarian shop? @ Pectolatra: No, it’s ”Simplelovebusiness”: We feel a little. You pay a lot. I know that some cultures are easier about touching, but Japan? If I wanted to get felt I’d go to the craft supply store. 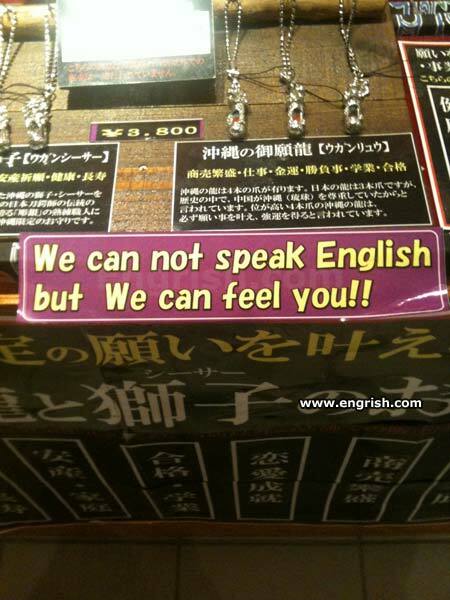 We can feel you… are welcome to come again! At first I was wondering why everyone in the shop was so afraid of me, and then I realized that “feel” was a misspelled word. Trial ballon slogan for the new TSA ad campaign. YO Dang, you feeling me? I feel you too, Dawg! Na min YO! We can feel it for you wholesale. I feel like its gonna be a very good night. Hey, at least body language is universal! We look forward to feeling you again. We feel your pain! It must be hard to read What We is saying! Oh no, no, no groping please! I just wandered in looking for some cheap souvenirs for the inlaws. You want to tell me you only write English? !